By Queen. Arranged by Todd Marchand. 22 pages. Published by Con Spirito Music (H0.179749-90690). Queen's iconic rock suite, "Bohemian Rhapsody," was released on the rock band's 1975 album, A Night at the Opera." AIthough initially receiving mixed critical reviews, it quickly became a commercial success, and over time it has come to be regarded as one of the greatest rock works of all time. 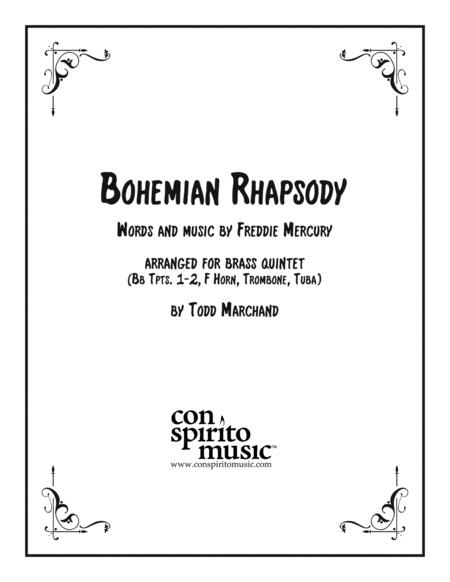 This arrangement by Todd Marchand demands strong chops, technical fluency, and mature musicianship from advanced high school groups, college ensembles, and community/professional musicians.